Some people that send packages during the festive season do not think about using holiday shipping labels. They mostly stick to using a regular plain design. Using these labels can be a great way to share the joys of the holiday. Since the labels are customizable – adding personal messages to them will be quick and easy. The template for the holiday shipping labels is free and can be downloaded from this page. The file is compatible for use with Microsoft Word 2003 or later. Click the download link and save the holiday shipping labels template to your computer. Can be saved to desktop or specify a folder for it to be saved in. Once downloaded – find the file and open it using the appropriate program. You will see six labels that can be customized. There are several areas to edit. You can start with the name and address in the ‘from’ area – the senders’ address. The other area to edit is the ‘to’ space – the address where it will be shipped to. The template includes an image of a wreath. You can leave this image or customize it and replace it with another image. Once you have customized the label to your needs you can save the file for later use. You can now print them out using compatible Avery shipping labels 5164, 5264, 5524, 5664, 8164, 8254, and 8464. Since the holiday shipping labels are easy to use and customize to your needs, you can use different color fonts and font styles for each area that can be edited. The address of the sender can be in red, and the recipients’ address in green. Practically, any font color or style can be used. 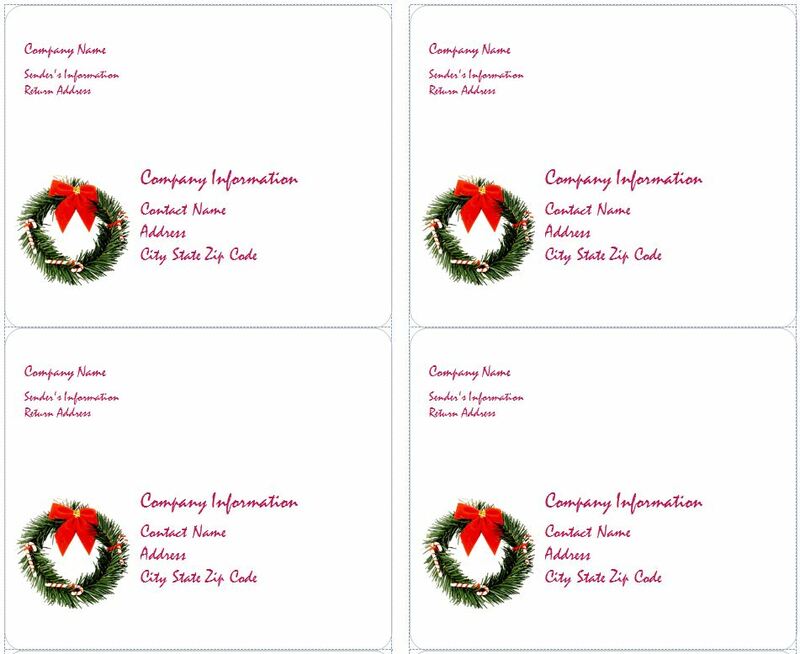 The labels are great for small business use as well as for anyone that will be sending packages during the holiday season. An individual can change the image of the wreath for a family picture celebrating the season. This is great for anyone that sends gifts by mail to friends and family. The labels can also be used as holiday tags too. Instead of including the addresses on both areas – simply type only the name of the gift giver and in the recipient area type in the name, and then add a personal message right after. Holiday shipping labels can provide a great way to share the spirit of the holidays when sending packages by mail. There are also creative ways to use them over and over again.